It is a medium-segment phone with 1GHz dual core processor. Talking about RAM, we've 512 mb. 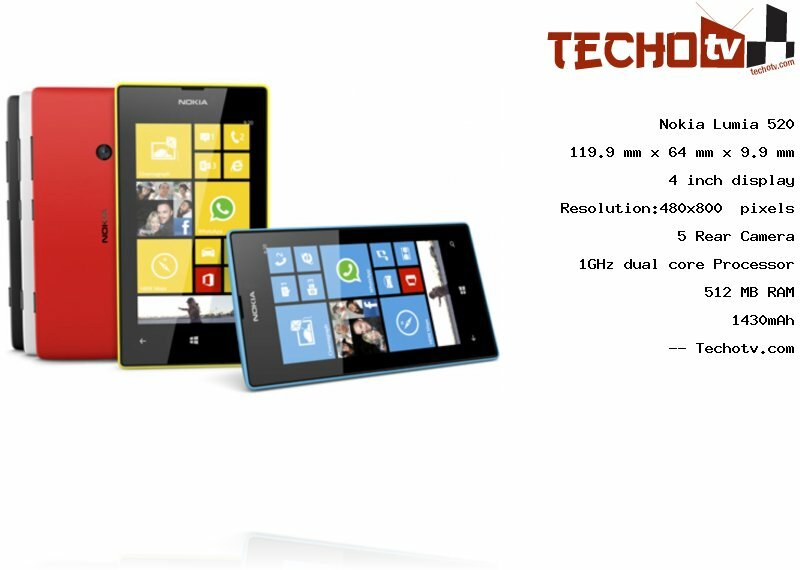 This phone has screen size of 4 inch and resolution of 800*480 pixels. With pixel density of 233 ppi, the screen looks good. It has height of 119.9 mm, width of 64 mm. The device is 9.9 mm thick. The total internal flash storage is of 8 GB. The user-available will be less. For shooting purposes, we've a rear camera of 5. Nokia Lumia 520 doesn't have a front camera. Sorry, The price of Nokia Lumia 520 is not available at the moment. Our team is keeping an eye on online stores to get you the latest price as soon as available. IPS LCD - Super sensitive to allow touch support using fingernail or glove fingers also. Here Maps, Offline maps, Nokia Music, Camera lens apps like cinemagraph, panaroma, etc. Nokia Lumia 520 is available in five colors - cyan, yellow, red, black and white. Snap-on covers of various colors are also available as optinal accessory to customize the exterior look and color feel as desired.